For most of my life, my stomach and I have been at odds with each other. Ever since I was a little kid, I would have stomach aches on a regular basis… about three times a week, sometimes more. They usually weren’t horrible — I could still function — but they were bad enough to make me chronically uncomfortable. I also lost a lot of sleep on numerous nights because of running back and forth to the bathroom. As I grew up, I basically accepted my low-grade stomach pain as a fact of life. For a while during my teenage years and early twenties, I didn’t do much to improve my eating habits. This, as you can imagine, only made matters worse. As I got older, however, I started to make an effort to eat healthier foods. I ate a lot of fruits and veggies, learned the wonder of a well-made salad, and said goodbye to microwave dinners and many other nutritionally abhorrent foods. Despite my healthier eating habits, my stomach pain persisted. It wasn’t every day, but there were at least a couple days out of each week that my digestive system was just angry at me, in one way or another. In my late twenties, I started getting frequently constipated. There were a couple weeks out of each month that things just would not move, so to speak. I tried prune juice, I ate more vegetables, I drank more water, all to no avail. Luckily, I eventually found one amazing food that has greatly cut down on my digestive discomfort: kimchi. 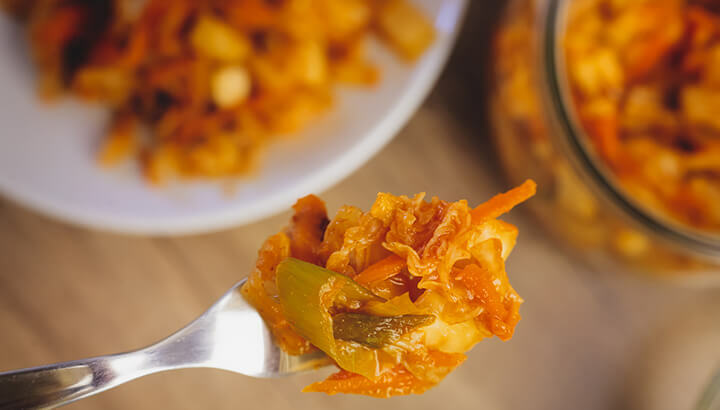 Kimchi can support the immune system, lower cholesterol and more. A year or so ago, my husband and I were at the grocery store. I was looking through the health food section (which was sadly rather small at the grocery store we used to go to), and I found jars of kimchi. This piqued my interest, since I love Asian food, and had tried kimchi as a flavoring agent in a dish years ago and really enjoyed it. I bought the kimchi and took it home. I tried to eat it on its own, but it was too strong. I then added it to a bowl of soup. It was delicious. That last benefit! That’s the one I needed! The other benefits are, of course, vital too, but I was really sick of stomach pain, so I was focused on the digestive benefits. However, even after eating my new kimchi every day for a few weeks, my stomach was no better. This was my own fault, and I’ll tell you why. In my excitement about kimchi, I had not properly read the label (I know, I really should have known better). The variety I had chosen was not a naturally fermented product, it was merely pickled. And, it had preservatives. I felt pretty silly once I finally discovered this. After I learned that my kimchi was an imposter, I was not about to give up on kimchi altogether. I found a small local company that makes real, fermented kimchi from fresh ingredients with no added preservatives, and bought myself a jar. The difference was amazing. Not only did it taste worlds better, my stomach (which had been hurting as usual) felt better the day I first ate it. I kept eating it every day, and voila! No more constipation! No more random stomach pain. Probiotics are no joke. To this day, I still eat kimchi every day. I have also decided that it’s high time to start making my own. It’s easy to do, check out this recipe. My husband and I recently bought all of the ingredients, and we’re set to make our very first batch this weekend. We’re making ours with napa cabbage, ginger, garlic, Himalayan salt and hot peppers. There are many varieties of kimchi, so experiment with veggies you like until you have the perfect batch that you enjoy. If your stomach is your enemy (like mine was for years), you’ll want to try this. Kimchi can be added to soups, slaws, salads and more. I personally love to eat my kimchi in soup. You can make an easy and delicious soup by boiling some homemade chicken, beef or vegetable broth, adding rice noodles or brown rice, and a few of your favorite chopped vegetables (I like tomatoes and spinach in mine). You can also crack an egg into the pot as the noodles are boiling. Once your soup is done, remove it from the heat, and add a tablespoon or two of kimchi to the pot. Probiotic goodness awaits. I also really like to eat kimchi with eggs — they make a great combination. Just don’t cook the kimchi with the eggs. Instead, add it when the eggs are done. I made this mistake, and had a bunch of burnt kimchi stuck to a pan, which did not smell or taste good. There are many other things you can do with kimchi. It can be tossed into a slaw, added to a marinade for flavor or used to top meats, salads and more. Get creative! 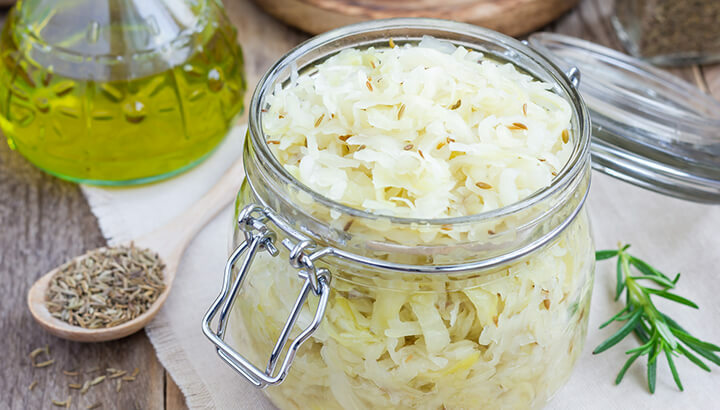 Eating probiotics every day, like sauerkraut, can aid digestion. Whichever probiotic you choose, make sure to get some into your meals — every day if you can. They may just save your stomach! Next articleWhat Really Happens When We Unfriend Someone On Facebook? 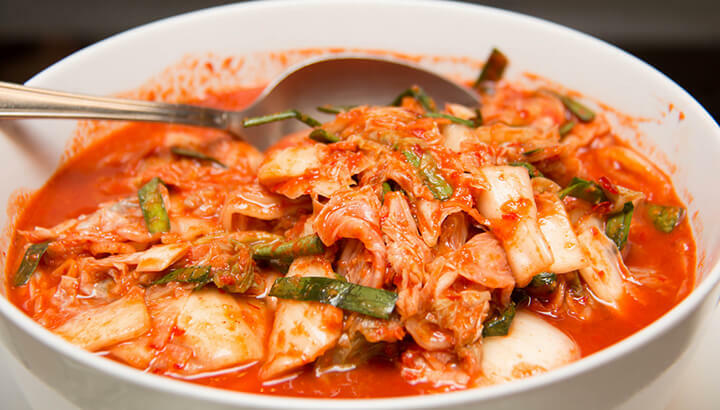 Hey Buddy!, I found this information for you: "How Kimchi Saved My Aching Stomach". Here is the website link: https://www.thealternativedaily.com/kimchi-saved-aching-stomach/. Thank you.